Posted on May 18, 2018 . by Patrick Johnstone. 8 Comments. The Canada Games Pool replacement project is moving along. We have just completed a second round of public consultation, and one group have taken this opportunity to encourage the City to do more than the initial concept plan that resulted from the work to date. As they spent some time delegating to Council and have got quite a bit of messaging in the media (social and otherwise), I figured I would write a bit about how we got here, and my understanding of the request. A couple of years ago, this Council made the decision to replace the Canada Games Pool (CGP) with a modern facility instead of investing tens of millions of dollars in replacing end-of-life components of the existing building and mechanicals. This has led to a lot of work on planning for a new facility, from figuring out what the “program” of the new facility needs to be, what it will cost, where it will fit on the site, and other technical and financial considerations. This has included two lengthy conversations with the public and stakeholders. There are a few points that constrain our opportunities here. Council agreed with strong advocacy in the community that the existing pool cannot be torn down until the new one is built – we cannot afford to have a lengthy period without the swim programs and other amenities that the CGP provides. It was also determined that replacing the late-life Centennial Community Centre (CCC) at the same time would provide worthwhile synergies and assure continuity of programming. Finally, an extensive analysis of locations around the City brought the conclusion that the existing location had many advantages, and that the cost of moving the pool to a different neighbourhood just didn’t make sense, financially or for the disruption it would cause. This is recognizing another limit on the current site, in that the front parking lot of the current pool was built on the upper reaches of the Glenbrook Ravine, which was filled in the 1960’s, burying a regionally-important sewer line under it. We cannot build above that sewer line (due to Metro Vancouver owning a right of way that excludes any construction), and moving it would cost a significant portion of what a new pool costs, so that further constrains the site. However, preliminary design and architectural work demonstrates that we can fit a decent-sized (~115,000 square foot) facility on the site immediately to the south and west of the existing pool. Another thing Council did was tour new pool facilities across the Lower Mainland. We visited the Edmonds Community Centre, the Hillcrest Community Centre, the Poirier Complex, the West Vancouver Community Centre, and more. We also had an extensive tour of the current Canada Games Pool. On all of these visits, we are able to talk to the operators and project planners to talk about what works, and what doesn’t. Most interesting was to discuss what they would do differently if they were to start a pool replacement project from fresh. A few of us even scheduled a visit to a larger pool facility in Gatineau when in Ottawa last year, and have been tracking new pool facilities across the region to understand who is doing what. Of course there have been a tonne of conversations here in New West with the pool user community, and people who don’t currently use the pool, but might like to except for its lack of serving their needs. There was both formal consultation and more informal meetings with stakeholder groups (such as the Hyack Swim Club). A few of us on Council also went out and did a few days of door knocking in the neighbourhoods around the pool to better understand what people think about the current pool, what they know about the replacement plans, and to hear if the budget freaks them out. I have to say the most consistent feedback I received was that the current pool is not as inviting to families and community use as other more modern facilities. Part of this is the somewhat aged structure (described by some as dank and stuffy), but also the lack of play space and the colder water temperature (which makes it better for competitive swimming) that makes it harder for families to enjoy the space together. We also had feedback that the gym was too small and not comfortable because it shared humid and warm airspace with the pool. We also heard from a significant user group that they loved the humid, warm gym environment. A very small number of people valued the diving towers and the water slide, but most wanted more flexible spaces. The value of the pool as a community amenity and the programs run by our recreation staff were a consistent theme, but when it came to details, there was a wide diversity of opinions. I have no idea who you are reading this, but I bet at least one point I raised above is something you disagree with, as is the reality of public consultation. The process to filter through this feedback included working with an architect experienced in building these types of facilities and measuring out what different program components would add as far as square footage and cost. The cost part, of course, includes the cost to build the facility, but also a business case based on the needs of a rapidly growing community. This means determining the capacity of pools, changerooms, gym facilities and such needed to accommodate (increasing) anticipated users. The operational costs are put into context of the potential for revenue generation and revenue growth. New Westminster is a relatively small city with challenging infrastructure needs, and it became clear that the budget was going to drive part of this conversation – we are going to build the best pool we can, but simply cannot afford to build everything that everyone wants. We knew hard decisions were going to have to be made. Amalgamating the public feedback and other data, and coming up with a program to fit as many needs as possible, was a challenging process. The report on the first round of consultation and the reasoning that led to the proposed program, can be read here. It is this program that the City took out for a second round of consultation last month, and we have yet to receive a report back at Council about the results of the consultation; that is the next step here. This is the background to the Hyack Swim Club’s appearance at Council to delegate on their needs and desires for the pool. I don’t want to put words in their mouth, but the message was that the proposed program is inadequate for holding the scale of meets that they think we can attract. We could still hold regional meets up to the level that the current facility can host, but we could not host national-level meets that are currently only possible at Kamloops and Victoria. In the media (social and otherwise) this has been characterized as requiring the addition of two more lanes, which sounds pretty minor, but there are hints it is more than this. So I’ll take a bit of time to put some context around that specific issue, recognizing this is at topic I am still learning about, so I stand ready to be corrected. 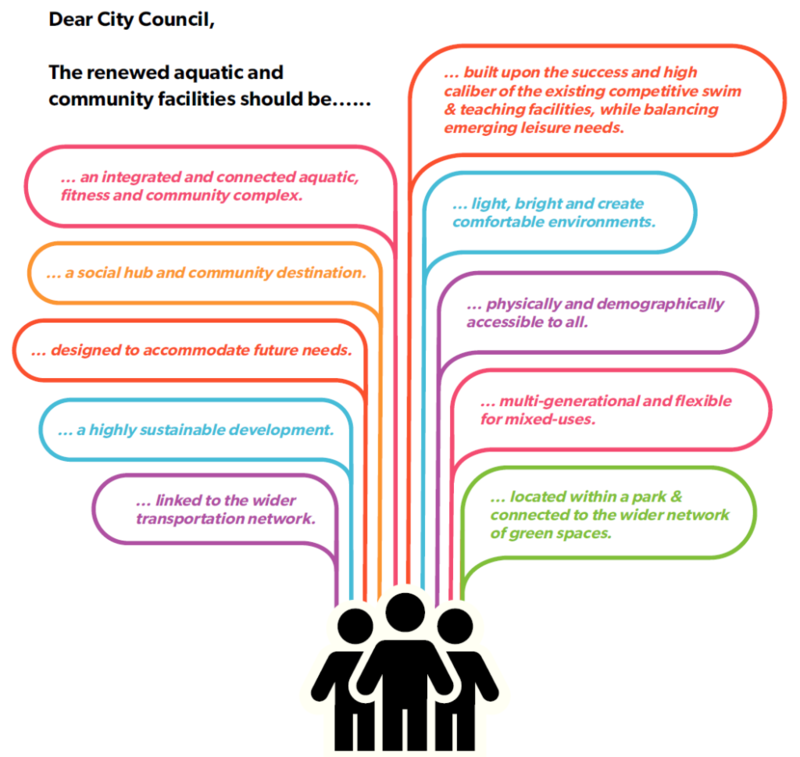 One big decision in any new civic pool facility is – do you build a 25m or 50m pool? The emphasis on fitness and lap swimming, including the legacy of the Hyack Club, is the reason the City suggested a 50m pool instead of a 25m pool (or even two 25m pools, which would be similar in cost to the one large pool, but provide much more user flexibility, which is the decision Richmond made with the new Minoru complex project). The demand analysis described above suggested that New West could meet anticipated swim demand by building a 25m 10-lane pool and a secondary leisure pool. It is the legacy of competitive swimming at the pool that led to the alternative 50m pool plan being considered. The current pool is 8 lanes, and the proposed program would also be 8 lanes, with 2.4m lanes. The proposal also includes a much larger leisure pool that can accommodate some lane swimming, but also have the amenities people come to expect from a community pool serving families and other leisure users. So, contrary to some social media reports, we are not proposing a smaller pool that we currently have, but one with a functionally-similar main tank, and a significant second tank. It is my understanding (and I stand to be corrected here, as I have some reading to do!) that the Hyack Swim Club’s request is not just for two more lanes, but a deeper main tank, a much larger secondary tank with potentially less family / leisure useability, a significant increase in deck space for stands, and perhaps some other functional changes. The full proposal needs to be evaluated for fit and cost (capital and operational). If I was to express frustration about this process, it is that the competitive swimming community always advocates for 50m pools whenever a new pool is built, but there never seems to be a pool built that satisfies their needs. Hillcrest and Grandview are just two recent examples of 50m pools that were built to accommodate a vocal competitive swimming advocacy group, but are(according to the presentations we received at Council) inadequate for competitive swimmers. 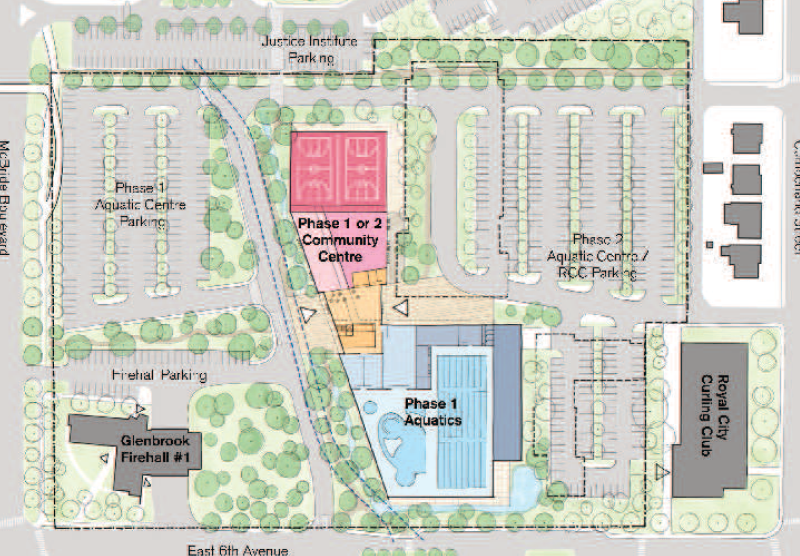 The proposals for the new Harry Jerome complex in North Vancouver is going through a very similar conversation today (note – that “editorial” in the newspaper is actually a paid-for sponsored ad, which is its own weirdness), and I hear from the recreation operators that there are simply too many 50m pools being built in the region. In summary, the conversation is ongoing here in New Westminster, and it is great that the Hyack Swim Club has been working to inform Council about their needs. I have had some correspondence from them since the Council delegations, and they have provided me some reading material to review. I hope to gain some better understanding about the details and (importantly) the business case implications involved in meeting the Hyack Swim Club’s expectations while not compromising what the rest of the community wants from a recreation facility. This conversation is not at all a setback for the project, but a perfect example of why we do public consultation. Our goal is (as it always has been) to have a project definition ready for when the Federal and Provincial government open the application window for infrastructure grants, and though there has been no confirmation of that date, we are in a good place to work out these details in time to make the window. Posted on January 2, 2018 . by Patrick Johnstone. 2 Comments. At the last meeting of 2017, Council received a presentation on the work done by staff, consultants, and the Mayors Task Force on a replacement facility for the Canada Games Pool. Here is my summary of the report, and where we are at on this project (through my eyes, at least). There is quite a bit of background in the reports presented, but the short version is that Council evaluated refurbishment and replacement options for the Canada Games Pool back in 2015. At that time, the cost for some of the significant mechanical and structural work on the facility was larger than Council was willing to invest in the aged facility. 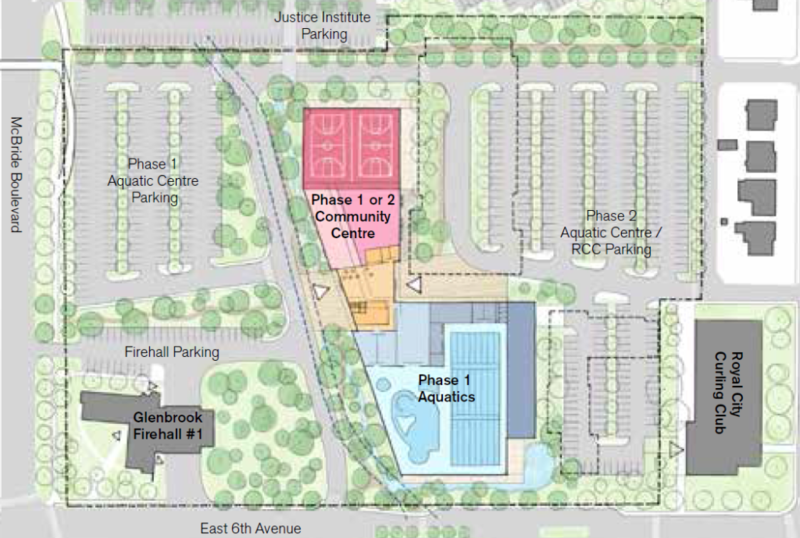 So work began in planning for a replacement and determining if the Centennial Community Centre should be involved in that replacement program, as it was similarly approaching end-of-life for many of its components. Council and staff worked together on setting some conditions around which future planning should occur. Work was done on a site analysis to determine if the pool should be moved (in the end, the business case did not support changing locations), and how/if to support existing programs during replacement (Council committed to not demolishing the old pool building until the new is built to maintain continuity in programming). Around the same time, a large public consultation and stakeholder engagement program (“Your Active New West”), engaged the community in discussions around what types of programs the new facility must have, what programs would be nice to have, and what the community was less committed to. The members of Council also toured a number of relatively recent pool and recreation centres around the Lower Mainland, from Coquitlam to West Vancouver, to hear from other communities what worked well and what didn’t in their facilities. A few of us even toured a facility outside Ottawa during last year’s FCM meeting. There was also a forward-looking needs analysis completed, looking at facility use now (at CGP and other regional aquatic facilities) by the numbers, and projected 30 years into the future. This included demographics on the types of users, facility capacities, and such to provide solid data to back up the expressed desires of the community, and support a business case for operating an expanded recreation facility. “Build it and they will come” is often true, but we need a defensible business case both to demonstrate due diligence, and to bolster our applications for senior government support. With all of this in hand, the Task Force worked with a team of consultants to develop a proposed program for a new combined Aquatic Centre and Recreation facility. This proposed program is laid out in the detailed Feasibility Study you can read here. From all of that, the current proposal is to build a natatorium (word of the day!) of similar scale as the Hillcrest Centre build in Vancouver in 2011: a competition-sized tank (8 full-width lanes, 54m long), with a movable floor on one half to provide flexibility of programming, and a separate large (~450 person) leisure pool primarily for family fun, but to also accommodate some (short) lane swimming. The proposal also includes two high-school sized gymnasiums, a fitness/exercise centre more than twice the current capacity, a childcare centre, and 8 very flexible multi-purpose rooms of varying size to accommodate the types of programs the Centennial Centre does now. Throw in change rooms, office space, and common areas, and you have 114,000 square feet of community centre. Amongst the many issues that the Task Force have worked on is how to fit that much building on a relatively constrained space. 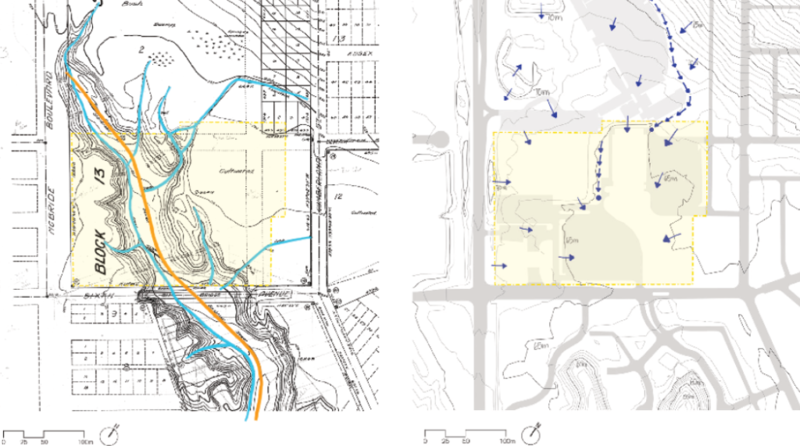 Keeping the existing facilities operating was important, and much of the area where the current parking lot and gravel field are cannot be built upon because of a buried Metro Vancouver sewer line and geotechnical concerns. The Firehall (it is almost new) and the Curling Rink (the City doesn’t own the building) aren’t going anywhere, though the recycling yard may me movable. With traffic access, CPTED, and logistics of construction, the site is very constrained. As I’m making these points, I need to emphasize that the design and layout suggested in the feasibility study are preliminary and diagrammatic. We don’t yet know what this building will look like in any detail, as we simply are not there yet in the iterative process of design, budget, and construction. However, we know what we want to build, and we know we can make it fit, so now is a good time to take this back out to the public and do a check-in before going forward to the next steps. There will be public consultation happening early in 2018, but this will be somewhat different than the previous community discussion in 2016-2017. This will be more of a check in to assure we have hit the mark from the earlier consultations, not a time to go back to the drawing board that we already spent a year scribbling on. We also need to start the discussion about how we are going to pay for this. The budget estimates (and yes, these are early estimates suitable to the early part of the iterative design and planning process we are going through, subject to change for various reasons within and outside of the control of Council) is that the entire centre will cost between $85 and $100 Million. When offering a preliminary estimate, we try to include reasonable contingencies, and are budgeting in 2020 dollars to account for some inflation. However, building costs do not necessarily track the CPI, and anyone trying to hire a contractor right now knows it is a crazy hot and expensive building market in Greater Vancouver right now. Needless to say, this will be the single largest capital investment ever made by the City of New Westminster. Council and staff have reason to be confident that the program proposed will qualify for some senior government grants, and potentially some significant Federal Infrastructure dollars. It ticks all the right boxes that the federal program has outlined (inclusive and accessible community infrastructure, improved recreational and social opportunities, significant energy efficiency gains and reduction in GHGs). That said, we cannot move ahead assuming those monies will arrive. We are required to put together a 5-year capital plan that shows we have demonstrated our ability to pay for this, and that will inevitably involve dipping into reserves, some debt financing, and tax increases. There’s no way around that. So over to you. Public engagement is coming in January, and in the meantime will be doing some more technical work on things like geotechnical constraints, parking needs, and some sustainability targets for the building (is LEED Gold the right standard?). We will also be preparing to submit grant applications to senior governments when the windows open (if you know anyone in Victoria or Ottawa, put in a good word for us!). This is a big project, and an exciting time for the City. Let’s hear what you think. It is important to let Council know what you like and if you support this project, and to let us know if you have concerns.